YONKERS, NY—A review of a series of in-depth studies conducted by Consumer Reports show that, in general, meat, poultry and shrimp from animals raised without antibiotics are less likely to harbor multidrug-resistant bacteria than conventionally-produced meat from animals that get the drugs routinely. During the past three years, Consumer Reports’ Food Safety and Sustainability Center has conducted tests of bacterial contamination in four different types of primarily raw and uncooked meat while also examining antibiotic resistance of bacteria as a consequence of antibiotic overuse, including the presence of dangerous “superbugs.” Hundreds of packages of meat, poultry and shrimp were methodically tested for bacteria and antibiotic resistance and analyzed by an expert team of scientists and statisticians. CR’s testing demonstrates that in most cases, there are lower levels of superbug contamination in meat from animals raised without antibiotics than in products from animals raised using conventional methods. For example, in CR’s most recent tests, the organization found that ground beef raised from conventionally raised cows was twice as likely as that from cows raised without antibiotics to carry superbugs. The number and type of bacteria that Consumer Reports analyzed varied for different tests, so the results from one test can’t be compared with those from another. Nowhere are antibiotics more inappropriately employed than in the meat and poultry industries, mostly to promote growth and prevent disease in crowded and unsanitary conditions. About 80 percent of the antibiotics sold in the U.S. are given to animals raised for food—including hogs, cattle, chickens and turkeys. “Making the World Safe from Superbugs” is featured atwww.ConsumerReports.org/superbugs-in-meat and in the January 2016 issue of Consumer Reports magazine, which hits newsstands Tuesday, December 1. It’s the final installment in a three-part investigative series focused on America’s antibiotic crisis. This piece examines the progress—and work yet to be done—to stop the antibiotic overuse in meat and poultry production that gives rise to dangerous bacteria. The release of CR’s story comes as the Centers for Disease Control and Prevention, the World Health Organization and Consumers International, a federation of 240 member organizations in more than 100 countries, mount campaigns to curtail the overuse of antibiotics to prevent the spread of superbugs. Using data from the Centers for Disease Control and Prevention, Consumer Reports calculated that about 20 percent of people sickened by an antibiotic-resistant bug don’t pick it up in the hospital or from another person—they get it from their food. At least 2 million Americans fall victim to antibiotic-resistant infections every year; 23,000 die. Antibiotics are losing their life-saving effectiveness. Their overuse has allowed bacteria to evolve so that they are almost impervious to the drugs. That has led to the rise of “superbugs”—which include methicillin-resistant staphylococcus aureus (MRSA) and bacteria resistant to three or more types of antibiotics. And as the number of superbugs increases, the development of new antibiotics to kill them has lagged. The most recent data from the Food and Drug Administration show that more than 32 million pounds of antibiotics were sold for use in food animals in the U.S. in 2013—up 17 percent from just four years earlier. In 2013, the FDA announced a voluntary plan to change the way veterinary antibiotics are labeled and sold. By the end of 2016, FDA plans call for requiring a veterinarian’s approval before feeding animals antibiotics that are important in human medicine. And while FDA says those drugs will no longer be approved for growth promotion they can still be used for disease prevention—which still allows healthy animals to be routinely fed antibiotics. However, California has recently gone further, passing a law to actually prohibit human antibiotic use not only for growth promotion but routine disease prevention as well. “Consumers can choose meat and poultry raised without antibiotics both at the supermarket and when they are eating out,” Dr. Rangan said. CR’s new report includes charts that show which chain restaurants and meat and poultry producers have the best practices on the routine use of antibiotics and other drugs as well as farm management practices and a sidebar piece on meat label lingo—what various labels consumers see daily in the supermarket actually mean. Among fast food chains, Chipotle and Panera have virtually eliminated antibiotics from their supply chain while four other major chains—McDonald’s Chick fil-A, Dunkin Donuts and Subway—have indicated they are in the process of reducing antibiotic use in the meat and/or poultry they serve though some of those changes are being phased in and will take years. Consumer demand is increasingly a driver of change—and there are shifts in the marketplace already. More than one-quarter of Americans report that they are buying meat and poultry raised without antibiotics more often than they did a year ago, according to a nationally representative survey of 1,008 adults from the Consumer Reports National Research Center in September 2015. Almost half said that they check products for a “no antibiotics” claim. There are many reliable label options for consumers that indicate routine antibiotic use was banned and better production and hygiene practices were used like organic, Animal Welfare Approved, American Grassfed, GAP, and Certified Humane. The “no antibiotics” label means no antibiotics were used which is value-added but does not address other drugs or farm hygiene practices. There are also labels to avoid, like “natural,” that have nothing to do with routine drug use or how the animals were raised. Many stores provide no-antibiotics product lines. The percentage of labels on meat and poultry packaging with claims about animals raised without antibiotics more than doubled between 2011 and 2014, according to a report from market research firm Mintel. 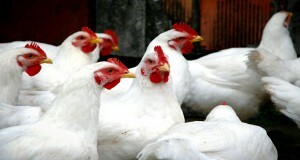 Meat and poultry sold at Whole Foods, for example, never comes from animals treated with antibiotics. The government should: Ban the routine use of all antibiotics in livestock and poultry industries, improve monitoring of ongoing antibiotic use, and prohibit misleading labeling, such as the “natural” label. The food industry should: Implement more sustainable agriculture practices, use clear and meaningful labels, and offer consumers more sustainable options. For more on antibiotics and superbugs, and how to help avoid them, visit ConsumerReports.org.Consumers can follow the conversation on Twitter at #SlamSuperbugs.